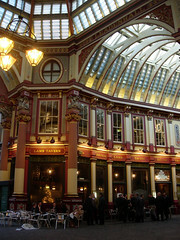 Young's pub in Leadenhall Market in the City. Note that it's closed on weekends, and possibly closes early on Mondays and Tuesdays. Apparently gets very busy (unsurprising, given its location). You can stand outside in the market with your drink, though. On a Tuesday in July 2009 it was busy outside but there were several tables available on the mezzanine. Food is served noon-9pm Monday to Friday, according to the website, although this may only be in certain parts of the pub (the website states "the dining room, the basement dive bar and the main bar"). On a Friday night in May 2008, they wouldn't serve food to the mezzanine, though we weren't sure whether this was just because it was a Friday. Serves a decent pint of Young's Special (£3.18 in July 2009). Bob visited on a Friday night after about 8:30pm. There was plenty of standing space in the main bar, and quite a few people outside. The mezzanine above the bar had free tables too. Over the evening there were fewer and fewer people. When the Waterloo & City Line Pub Crawl posse visited on a Friday evening in May 2008, at least one of the barstaff was serving people quite egregiously out of order. Toilets are on the first floor. There is no obvious disabled toilet. There is karaoke on Wednesday supposedly. Last visited by bob and others, 21 July 2009. Opening hours and food times taken from the Young's website, February 2008. Last edited 2013-05-10 07:28:04 (version 21; diff). List all versions. Page last edited 2013-05-10 07:28:04 (version 21).